I'm writing this on a sunny 40-degree afternoon in the window of my favorite coffee shop downtown. Sipping iced-coffee, I'm wearing a cotton button-down and just a light jacket. I don't think I'm alone in this change of pace after feeling like this winter was going to last for forever. It's time to embrace this change. We're switching out our snow tires for standard wheels. We are picking up fresh flowers on our trips to the grocery store. We are clearing out space in our spare closet to put our parkas. Among all these region-wide changes, we here at Design & Living have a big change, too. I'm Alexandra Martin and I'm the new editor of Design & Living. If you're a follower of other Spotlight Media publications, you might recognize me as the editor of Fargo Monthly. I'm not new to the company, but I'm new to Design & Living and I'm excited to ring in this new season of weather with a new season of this magazine. Not to worry, all your favorite parts of the publication will remain the same, just with a new editor at the helm. To all our partners and contributors: I'm excited to get to know you better and to share your stories and work with the community. To our readers: hello, nice to meet you! I'm eager to continue to share beautiful home and lifestyle inspiration with you. I'm so fortunate to be filling the shoes of our previous editor, Becca Opp. These are big shoes to fill and I'm honored to be trusted by you dear readers in carrying on the legacy of this magazine. Those aforementioned changes in mind, this is the perfect time of year to really refresh your home and find goods that, as Marie Kondo would say, "spark joy." As someone who is weak to the temptations of retail therapy, I came across countless items that I wanted for my own home. In fact, at Baker Garden & Gift I ended up purchasing a throw pillow that we photographed. After this, I feel I deserve applause for the restraint I showed by only buying ONE thing from the shopping guide we curated for this issue. That being said, I encourage you to not show the same restraint I did. Put on your rain boots and enjoy splashing in melted snow puddles as you visit some of these local stores we gathered products from. After this long, long winter, we all deserve some fresh picks in our homes. 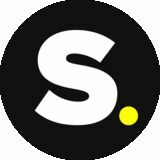 Opp is an associate writer at Sundog Interactive and a contributing writer for Design & Living Magazine. Opp loves supporting local art and calls Downtown Fargo home. Gunkelman is current Home Builders Association of F-M president. He owns Dakota Construction of Fargo, Inc., specializing in custom homes, commercial remodeling and residential remodeling. Warmer days are ahead and we can't wait to freshen up our homes. To help you with this task, we've curated a collection of on-trend products from local retailers to help you brighten up your favorite spaces. Baker Garden and Gift is more than meets the eye. When you enter, you find home-gifts, greenery, garden supplies and multiple greenhouses. Baker Garden and Gift has a bit of everything for everyone, which is just one of the many reasons it gets to celebrate its 60th anniversary of business this year. North Dakota Interior Designers (NDID) celebrates 15 years of enriching environments, achieving excellence and connecting professionals. Over these years, what began as a group of about 15 passionate designers has grown to over 250 individuals in related fields, coming together to celebrate design and expand their skillsets. Artisanal home goods, cruelty-free beauty products and fair trade clothing—these are just some of the products you can find at Others in Downtown Fargo. 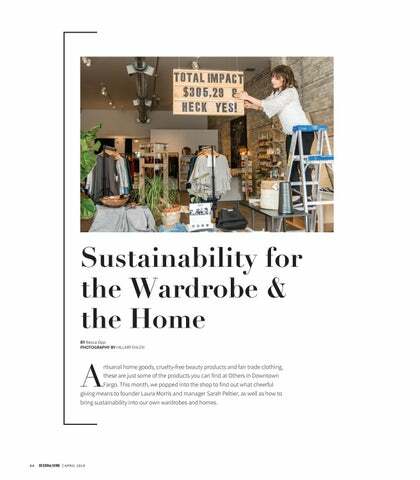 This month, we popped into the shop to find out what cheerful giving means to founder Laura Morris and manager Sarah Peltier, as well as how to bring sustainability into our own wardrobes and homes. Grafton native Tony Ward founded custom furniture business Ward & Weston in Fall 2017. We stopped into Ward's workshop to learn about his process and his lifelong passion for the trade. Next Month's Issue Old is made new again with our flip homes issue! We will be featuring area homes who have recently undergone a flip for the better. In each issue of Design & Living Magazine, Christen Anderson of Christen Joy will answer a home design question posed by one of our readers. This month she addressed refreshing the bedroom and how to make the perfect bed. Local artist Anna Lee has found inspiration in winter hibernation. Now, as the sun begins to shine down on North Dakota, she is ready to share her new collection, “Body of Work,” which is a part of her ongoing “Gray Matter Series." 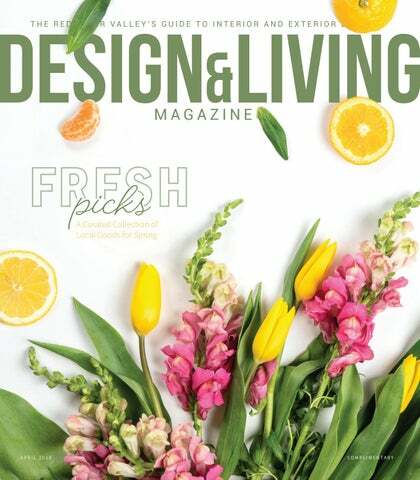 APRIL 2019 Design & Living Magazine is a free publication distributed 12 times a year. Our mission is to showcase all that the Red River Valley has to offer in terms of interior design, architecture and landscaping, profiling the people that make these possible. We also strive to provide a quality and fun reading experience and improve the way of life in our community. 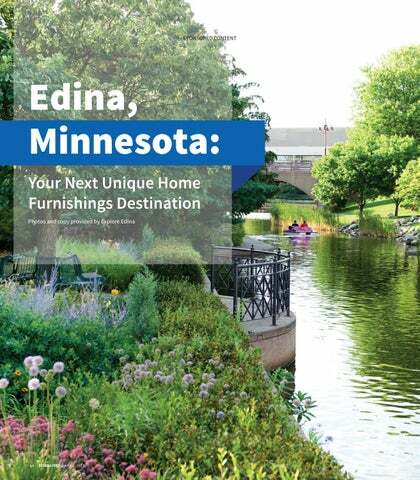 The publication is mailed to homes across the US and has stand distribution throughout North Dakota and Minnesota. As the demographics of Fargo-Moorhead change so too are our workplaces. In honor to recognize and honor this changing diversity, the FMWF Chamber of Commerce has recently launched the Professionals of Color program. We will meet several members of this committee and take a look at why this is a needed addition to the FM business scene. This month, we are diving forks first into all the hottest brunch spots. Whether you are looking for a birthday brunch with the girlfriends or some carb-filled fuel to break a hangover, Fargo restaurants have you covered. We hope that after reading through this, you'll think about becoming a "morning person," after all. In what was intended to be a possible "developmental" year for the young North Dakota State Bison men's basketball team, they ended up proving their doubters wrong. Battling through a tough non-conference schedule, the Bison could have just as easily caved in. They did not, streaking through the Summit League slate all the way to the conference's tournament championship game. The result? North Dakota State's fourth NCAA Tournament berth since 2009. Who says they're not ready now? FANSVOTE ON THEIR FAVORITE TRENDS The Home Builders Association of F-M's Spring Parade of Homes is all about ideas, trends and making plans for the future. Happening the first three weekends in May, it showcases newly constructed homes in our communities. While we patiently wait for spring and warmer weather, we thought we’d inspire you with the results of polls hosted on social media during our event last fall. What are your favorite trends? Make a list of your priorities and look for them when you head out to the homes next month! Learn more about the event at www.paradefm.com or on Facebook and Instagram @paradefm. No matter where your tastes lie, we invite you to explore the area's new developments, infill communities and over 75 homes that truly offer something for everyone! Whether it’s a popping backsplash or cabinets with a kick, which look do you prefer for your statement kitchen? Continuing on the trend to make a statement in your home, what’s your favorite bold design feature: concrete fireplaces or black appliances? When you’re putting the finishing touches on your home, what’s your style: light or dark furniture? John Gunkelman is current Home Builders Association of F-M president. He owns Dakota Construction of Fargo, Inc., specializing in custom homes, commercial remodeling and residential remodeling. Which bathroom feature makes you say “ooh la la:” round personal mirrors or a big rectangular shared mirror? In the battle of the basements, where do your allegiances lie: a bar or a theater? WITH SPRING IN THE AIR, I’M REFRESHING MY BEDROOM AND AM READY TO INVEST IN SELECTIONS THAT MAKE MY BED FEEL COMPLETE – WHERE DO I BEGIN? Answer: I love a spring refresh and after our long winter, we all deserve it! There are several questions that come up when starting to shop for the place that you spend quite a bit of time in, that being your bed. It must be a place you look forward to curling up in and furniture pieces that you’re proud of when new guests are given a house tour. I recently worked with a mother and daughter to design their new condo and had the pleasure of selecting all the items for their bedrooms. Let me give you a tour of the completed bedrooms and give you an overview of where you can start making the space you’re dreaming about a reality. BY Christen Anderson | PHOTOS BY Hillary Ehlen Meet Christen Anderson of Christen Joy: Inspired Interiors & Events. Each month, she will answer a home design question posed by one of our readers. Anderson is a Minnesota native with an eye for decor and design. Christen Joy is known for new-construction commercial projects, exceptional remodels, expert staging and accessorizing high-end living spaces. Anderson is also a passionate art collector, world traveler and home cook who frequently entertains for friends. shapes they come in. Your most common types of pillows and shams used in the bedroom are: Euro, Standard, Square and Bolsters. For the condo, I wanted to have pillows that have high functionality and are not just décor-oriented. With this in mind, I purchased four pillows for each bed that could be used as they wished and kept the accent pillows minimal for each bed (one!). FOUNDATIONAL THOUGH UNIQUE Before you leave the store or checkout online, add in a few personal touches that will make your space unique. You may be able to add in monogramming with a few quick clicks of a button; adding your initials, selecting a font and completing the look with your choice of color. This inexpensive detail takes your bedding to the next level. I added monogramed sheets and a duvet cover for the daughter’s room. It felt like the perfect touch for the Parisian-themed room, which was designed to include thoughtful and beautiful details, soft rosy pinks and furniture that is cute and girly. MAKE YOUR BED Now that your cart is full of delicious bedding, let’s talk about how to make the bed. Email your design questions to christen@livechristenjoy.com for the opportunity to have them answered next month. together, and flip them back roughly one-third the size of your mattress leaving the top third of your bed with the fitted sheet ‘exposed.’ Lastly, add your pillows. I prefer the pillow you sleep on be stacked against the headboard and then your additional, possibly fabric matching pillow sham, stacked in front of your everyday sleeping pillow. Complete the look with a fun throw pillow. Voila – quick, easy and beautiful! THE “COMPANY’S COMING” MADE BED Now that we have the basics down, here’s an outline on things that I’d recommend when you have company over or have an extra four minutes in your morning. When it comes to your flat sheet (aka top sheet), do make sure that if it has a pattern on it, to place it pattern side down (this will look ‘inside-out’). This way, when you fold it over, the pattern will be there for all eyes to see. Since we’ll most likely be spending more time than our typical morning routine to make our bed, tucking your flat sheet is a must. To me, tucking your sheets gives your bed a much cleaner, overall look. I tend to always lean towards the ‘hospital corners’ method when I tuck my sheets. Here is that breakdown on how to do so: Start by tucking in the bottom edge of the flat sheet at the foot of the bed. Working from corner to corner, lift the bottom corner of the sheet up to make a 45-degree fold, then tuck the remaining sheet corner under the mattress. Drop the 45-degree fold down and pull smooth. Finish by tucking the remaining edges of your sheet into your bed frame or under your mattress. To dress up your duvet/blanket/ comforter/bed spread, pull your flat sheet along with said item together half-way back then bring a quarter of the way forward towards the headboard. This will give the illusion of a very full and plush bed. Another helpful tip if you really want to achieve a full look would be adding in an additional comforter. Lastly, take a quick minute to wipe away wrinkles. Tugging in a downward and away motion will help leave a smooth surface. Helpful tip: Wrinkle Releaser by Downy saves a ton of time and is a nohassle item with no cords or dribble of a steamer. Plus, getting it in a fresh spring or lavender scent will also help with a great night’s sleep! When layering your made bed, here is the order that I would stack and arrange said pillows: Euro pillows and shams are typically square and are your largest, so these would be situated in the back along the headboard. Placed directly in front of your Euro sham would be your standard pillow and sham, which are typically rectangular and firmer. Square pillows and bolster pillows, which are a cylinder shape, are your accent and decorative throw pillows. Place these in no specific order in front of your standard pillow. THE FINISHING TOUCHES Finish your bedroom with ideal lighting, fresh flowers or greenery, your favorite scented candle, concealed cords for a clean look and, if you prefer, a white noise machine (instead of a fan). Now, snuggle up, sleep-in and enjoy your new refreshed space! Depending on the season, you may want to add in extra layers for additional warmth. Any sort of blanket or quilt would be placed on top of the flat sheet. In between a Casey's General Store and a Sanford medical center on University Drive is a botanical oasis: Baker Garden and Gift. Baker Garden and Gift is more than meets the eye. When you enter, you find what appears to be a standard home-gift store, stocking everything from scented candles to witty dishtowels to marble cheese boards. As you walk through, you find the opening, which leads to seemingly endless expanses of greenery, garden supplies and multiple greenhouses. Baker Garden and Gift has a bit of everything for everyone, which is just one of the many reasons it gets to celebrate its 60th anniversary of business this year. IN THE FAMILY Eric Baker is the third generation owneroperator of Fargo horticulture staple, Baker Garden and Gift. His grandfather, Harry Baker, founded Baker Nursery in 1957 on University Drive and 19th Avenue out of a temporary garage. In 1967, Harry's son Ken took over, paving the way for the transitioning of the business to Eric in 1993. In each generation, the different owners all implemented new changes and growth. Eric Baker said, "It’ll be interesting to see what we’ll do in the future. 60 years is a good mark and I’m excited to carry on the family tradition." A DIFFERENT APPROACH In Baker's first year of college, he took a management information systems course, which he described as a computer class relating to a certain software program. He enjoyed this class and particularly embraced its database aspect, which he went on to utilize at the greenhouse for its production cycle. He said, "Even though I work in an industry that’s non-tech related, I’ve always raced to do the next innovative thing. The old adage is, 'It’s not what you do for a living, it’s how you do it,' so I embrace doing things a bit differently than the traditional greenhouse owneroperator." This forward-thinking has helped keep the store thriving all these years. "I look at plants kind of like systems, so it’s a matter of a way to figure out how to grow them and keep them active," said Baker. 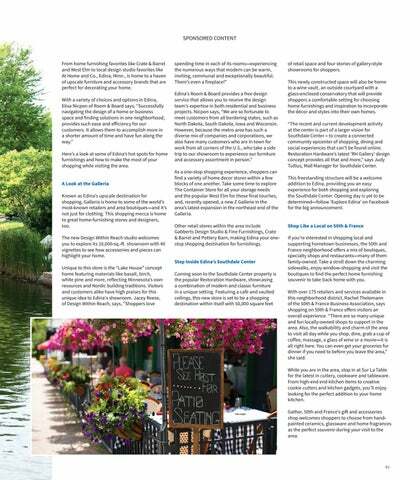 BLOOMING BUSINESS Since its founding as "Baker Nursery" 60 years ago, the business has seen an evolution: growing, rebranding and offering different services as demands shift. In 2004, Baker rebranded from Baker Nursery to Baker Garden and Gift, adding the gift storefront to the existing greenhouse portion. "As things changed, we have put more of a focus on the gift section with the rebrand. We decided: let’s try and carry unique items. So in the last 10 years, we’ve had a couple of good and innovative gift buyers and it’s always fun when they come back from market." Beyond the addition of the gift sector, more recently they have added seminars and workshops. Baker noted that hosting workshops is on-trend for the industry and has certainly been received well within the community. 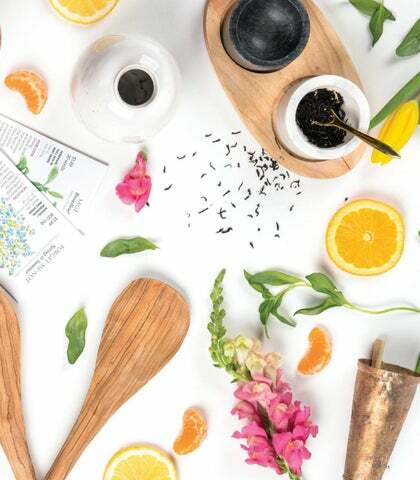 These workshops are always plant-oriented, ranging from creations of mini succulent gardens to Marimo apothecary jars to spring hanging baskets. Baker added, "We’ve found out that it’s more about the experience than actually doing the workshop. And I think that’s on-trend with retail in general. It's about engaging more than it is the products." percent of our business, so it makes up a respectable part of the business. We can install anything we retail. We do large and small projects, including paver patios with fire pits and finished patios." This sector deals with things like landscape design and execution, as well as the installation of tree shrubs and such. Each of these divisions has its own staff and specialists, ensuring that the right attention and care is given. Baker commented that he has a really solid team in place and feels confident in those handling the different sectors of this business. A FARGO NECESSITY Despite the climate, the Red River Valley's residents get excited about plants, making businesses like Baker's thrive. Even when the ground is coated in snow, locals seek indoor plants and greenery to enrich their households and workplaces. Baker shared, "People are locked up in their houses all winter long—particularly this winter—and they are just itching to get outside and start doing something. "That’s the interesting thing about this industry. I go to a lot of trade shows and people will see I'm from Fargo and they’ll say, 'Gosh how do you do it?' I tell them that people are really motivated to do something once spring hits. They are all for it." He noted that people who live in more temperate climates have larger access to gardening year-round, so there’s not as much of a big build-up or anticipation as there is here. 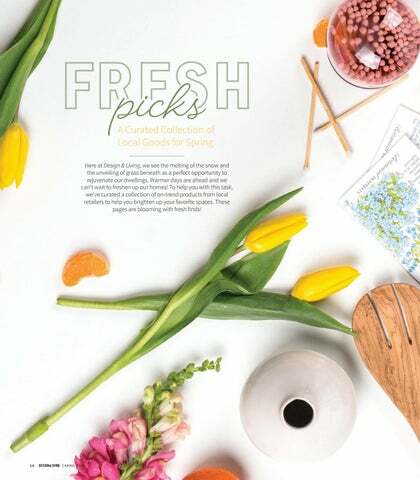 A Curated Collection of Local Goods for Spring Here at Design & Living, we see the melting of the snow and the unveiling of grass beneath as a perfect opportunity to rejuvenate our dwellings. Warmer days are ahead and we can't wait to freshen up our homes! To help you with this task, we've curated a collection of on-trend products from local retailers to help you brighten up your favorite spaces. These pages are blooming with fresh finds! aspects of the organization, part of NDID's mission is to support the community. One way they do this is by supporting up-and-coming designers and providing scholarships to NDSU interior design students. Part of their ongoing list of goals for future growth is to be able to put more money in their endowment fund to support more of these scholarships at NDSU. When they are not supporting emerging interior design talent, NDID is visible in the community in charitable endeavors. In the past, members have participated in Habitat for Humanity Events, aided in decorating for Ronald McDonald House Charities and sponsored Christmas projects for families in need with YWCA and Churches United for the Homeless. Group photo of NDIDâ&#x20AC;&#x2122;s team that participated in the Tour de Habitat Bike Ride to raise money for Habitat for Humanity. Most visible of their charitable endeavors is their annual production of"CANstruction." Local architects, interior designers and construction managers get together to build structures out of canned goods at West Acres Mall. Trading in steel beams and shiplap, these professionals artfully built structures out of canned goods instead. The building materials are then donated to the Great Plains Food Bank. rtisanal home goods, cruelty-free beauty products and fair trade clothing, these are just some of the products you can find at Others in Downtown Fargo. 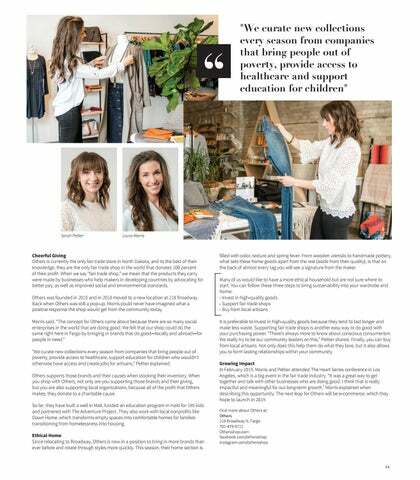 This month, we popped into the shop to find out what cheerful giving means to founder Laura Morris and manager Sarah Peltier, as well as how to bring sustainability into our own wardrobes and homes. 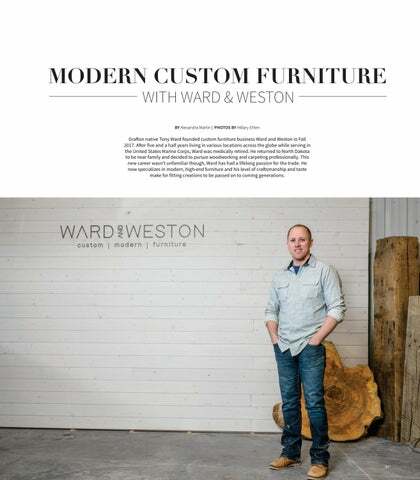 "We curate new collections every season from companies that bring people out of poverty, provide access to healthcare and support education for children"
Grafton native Tony Ward founded custom furniture business Ward and Weston in Fall 2017. After five and a half years living in various locations across the globe while serving in the United States Marine Corps, Ward was medically retired. He returned to North Dakota to be near family and decided to pursue woodworking and carpeting professionally. This new career wasn't unfamiliar though, Ward has had a lifelong passion for the trade. He now specializes in modern, high-end furniture and his level of craftsmanship and taste make for fitting creations to be passed on to coming generations. EARLY BEGINNINGS Ward was only 14 when he began his journey with carpentry and woodworking. He found success in a high school shop class, sharing, "The first thing I built in shop class was a serving tray. Then from there, I had a couple of teachers want me to build them TV centers and that’s what really got me into doing furniture." Once he started, he began picking up client work. His first client was the church he grew up in, who requested he build them a cabinet for the church. From the start, Ward has always enjoyed custom projects and building one-of-a-kind pieces. HAND TOUCHED In today’s world of computerized manufacturing, Ward feels the importance of creating and building products by hand. Rather than using a CAD system to design, Ward prefers a completely custom process, hand drawing everything he creates. He noted, "I find if you draw it first, you kind of build it while you are drawing it. So as soon as you want to build it, you’ve already built it once in your head, so that makes that whole process better. If I do it on the computer, it takes away from that process." A SPECIAL PIECE This grid coffee table is the embodiment of the detail and craftsmanship that Ward puts out. Averaging at about 50 to 60 hours to make, this piece is time-consuming to ensure the pattern is done correctly. Ward added, "Each strip takes me about six hours to make. It’s very sturdy when it’s put together, though. That’s why I like the grid pattern." Once tediously constructed, the piece is finished off with a specialty hand-oil finish. "I make my own oil, it's a mixture of varnish and some oils, it's a secret recipe," said Ward. While the end result is modern, Ward took inspiration from the past, saying, "On old ships, they had doors with a grate system on them, that's where I got my idea from." Seeing motifs from a former time and making them new again with contemporary twists honors the history of the woodworking trade. While Ward prefers modern designs, he enjoys working with old barn wood on pieces as well, marrying old and new to keep his designs felicitous in 21st Century homes and businesses. PRECISION In these sleek modern pieces, precision is key. "You have to have your set-up perfect, that’s why it's so time-consuming. You have to make sure the actual saw is perfectly set up, the jig is perfectly set up an then actually have to run the piece through and run it through accurately," said Ward. This precision doesn't end with just his goods. Ward's workspace is pristine, something you might not expect from an active workshop. He shared, "I prefer and clean and organized shop because I don’t like messy, I tend to not be able to think as well when it’s messy. The cleaner it is, the better for me...and it’s safer." iving in Fargo, it can sometimes feel as if we are stuck in an endless winter. However, local artist Anna Lee has found inspiration in hibernation. Now, as the sun begins to shine down on North Dakota, she is ready to share her new collection, “Body of Work,” which is a part of her ongoing “Gray Matter Series." 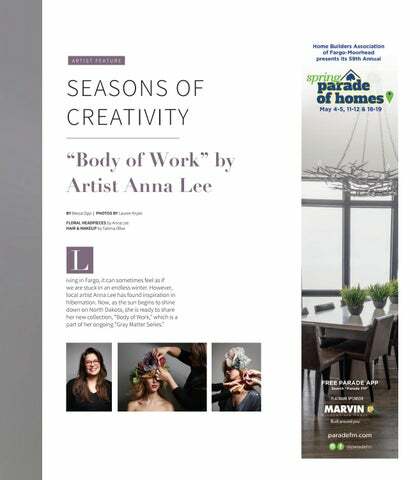 Working in a Series and In Seasons The Gray Matter Series is a name that encompasses all of Lee’s current creative ventures, including painting, millinery, film and so much more—you could say that she wears many hats. In Fall 2018, she produced “Gray Matter Series: Sense of Self,” which was on display at Luna. Each season, Lee conjures up a new collection. This is one of many influences from her decades spent in the fashion industry. The Beauty of Hibernation For Lee, winter is a time to look inward and reach outward to the community. While steeping a pot of tea over conversation in her Moorhead studio, she explained, “The beauty of hibernation is that we go deep within, whether we want to or not. This winter, I dedicated myself to figuring out what had been hiding inside while I was busy in the energy of spring and summer. “Winter is a magical time to commit to your art. It's really distinct in the Upper Midwest and Fargo. Growing up, we are not taught the power in that—everyone gets cranky about the weather. “I actually enjoy winter now. If we take care of ourselves, we bloom with more vibrant colors when spring finally comes. When we've tended to our soil, the flowers that blossom from it are so much more luxurious, and we can share them with others,” Lee said. An Explosion of Flowers Lee’s vision for her spring collection was an explosion of flowers. It is safe to say that flower crowns are everywhere right now, and Anna Lee is no stranger to this trend. However, what sets her new pieces apart is that each flower looks like a 3D illustration. “It's an entirely different experience when you wear this flower versus flowers that I would've done a few years ago. With these, I feel that there is more of an intensity, there is more of a story,” she described. Recently, she has drawn inspiration from her creative guidance sessions. “In my coaching and mentoring, I began drawing the things I was seeing and sensing when working with a client,” she said. From each of these sessions, Lee’s clients walked away with an extremely personal and meaningful work of art. Some of these portraits feature flowers reminiscent of motifs that Lee has been doodling ever since she was a child. “Body of Work” Through “Body of Work,” Lee expresses all aspects of herself as an artist and as a human being. “I've been pulling together the things that I've been doing for years and the things that I am just starting to bring into my career. The other side of “Body of Work” is more personal, where I have been spending time investigating what it means to get through winter with Seasonal Affective Disorder,” she shared. which allows us to work through these concepts. It's like a garden. You plant seeds and see what sprouts, what thrives, and you amend the soil to cultivate creativity,” said the artist. When it came to bringing this collection to life, she reached out to top industry professionals and two of her frequent collaborators, photographer Lauren Krysti, hair and makeup artist Fatima Olive and fashion designer Gina Moorhead of House of Gina Marie; when the stars align and they are able to get together, something special happens. “With this photographer and hair and makeup artist, it’s like they have their own language,” Anna Lee revealed. Construction To create the explosion of flowers that you see within these pages, Lee had to experiment a little bit. When watering the seeds of this concept in her mind, she asked herself, “How do I bring in more of myself to make flowers that are even more of the aesthetic that I am going after? Instead of just working with millinery supplies, how can I work with raw materials?” For the production process, she started by sketching petals. Lee would then paint, and draw over top of them. Then she scanned the petals, reformatted them and then had the design printed on chiffon because this was the best way to get the pattern to show through on both sides of the fabric. The challenge was then giving structure to the textile and getting the chiffon to hold its shape. people get to know themselves better. 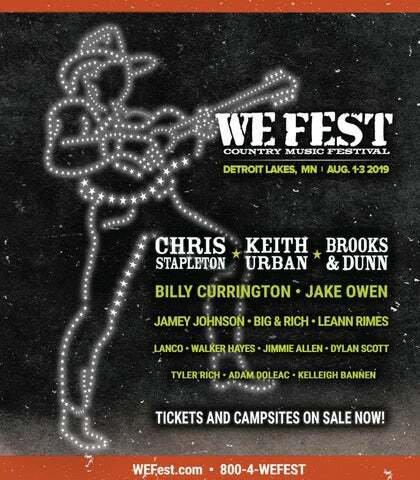 “There will be one workshop in Minneapolis and one in Fargo. I've been spending time in both and to be able to host the workshop in both cities is very important to me. One of the things I have been working to cultivate is a sense of community wherever I am,” Anna Lee said. For this artist and entrepreneur, winter is a time for solitude and for seeking camaraderie within the creative communities of Fargo and Minneapolis. Speaking from my own experience, I can attest that for all of the inspiration Anna Lee has within, she is twice the inspiration for young creatives. I hope you enjoy her Spring 2019 collection, “Body of Work,” as much as we do.